New Zealand pop star claims she didn't make the right call when she decided to perform in Tel Aviv. New Zealand pop star Lorde said on Monday that it is the “right decision at this time” to cancel a summer concert in Israel. “I pride myself on being an informed young citizen, and I had done a lot of reading and sought a lot of opinions before deciding to book a show in Tel Aviv, but I’m not too proud to admit I didn’t make the right call on this one. Tel Aviv, it’s been a dream of mine to visit this beautiful part of the world for many years, and I’m truly sorry to reverse my commitment to come play for you. I hope one day we can all dance,” added Lorde. News of the cancellation of Lorde’s June concert in Tel Aviv came on Sunday, days after pro-Palestinian Arab fans in her native New Zealand criticized her. Israeli concert organizers announced the cancellation and said ticket sales would be refunded. 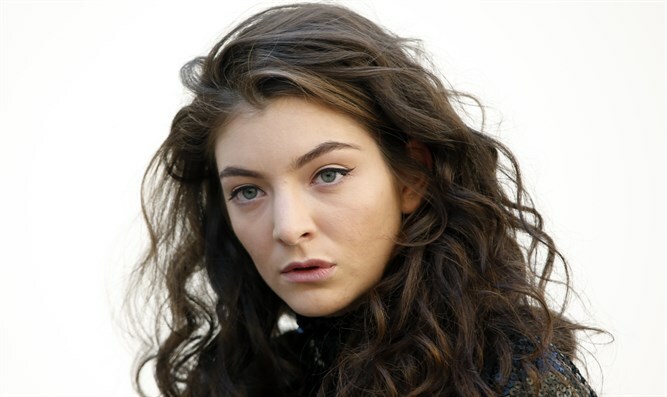 Culture Minister Miri Regev on Sunday urged Lorde to reconsider her decision. “Lorde, I expect you to be a ‘pure heroine’ like the title of your first album. A pure heroine of culture, void of any foreign political considerations, not to mention delusional ones,” Regev said. The New Zealand Jewish Council responded to the cancellation by its local music icon. “We are deeply disappointed that Lorde has succumbed to a small but loud group of extremist bullies. Boycotts of Israel will not lead to peace. Those who advocate them are not interested in negotiations between the two sides to this conflict or a two-state solution,” spokesperson for the Council, Juliet Moses, said, according to JTA. “By cancelling her show, Lorde has sided with those who support the isolation and demonization of the one Jewish state in the world. She has ignored the moderate voices, including the vast majority of Jewish Kiwis, who believe in dialogue and co-existence, and the leading musicians like Radiohead, Nick Cave, Guns N Roses and Justin Bieber who have performed in Tel Aviv in the last year. She will still be performing in Russia, but no one accuses her of complicity with Putin, the occupation of the Crimea or chemical warfare in Syria,” Moses added. Foreign artists who seek to perform in Israel are under constant pressure from BDS activists to cancel their shows. Much of this pressure comes from former Pink Floyd frontman and notorious anti-Israel activist Roger Waters. Most recently, Waters clashed with Australian rocker Nick Cave, who resisted boycott calls and went ahead with his Israel show and even criticized the BDS movement. In addition to Cave, Radiohead played in Tel Aviv this past July, defying boycott calls. Popular rhythm and blues artist Alicia Keys and pop duo Pet Shop Boys are among the artists who have also performed in Israel in recent years, amid calls to cancel their show. At the same time, several popular musicians, such as Elvis Costello and Lauryn Hill, have cancelled past concerts in Israel following pressure from BDS.